The events surrounding Premiere Napa Valley were quite impressive. The Napa Valley Vintners and individual AVA associations know how to throw a party. The whole PNV week is basically a big party celebrating all things Napa. It doesn't hurt that NVV has a multi-million dollar budget to work with and they were wooing the world's top wine media (present company excluded) and trade members itching to spend tens of thousands of dollars, but that shouldn't stop emerging regions like Colorado from learning how to host similarly successful events. The first thing that made the event successful was that they offered something desirable. The opportunity to taste some of the world's most unique and expensive wines. The wines came in 5, 10 and 20-case lots that can be found nowhere else. Over 200 wineries try to outdo each other in creating special blends or unique one-offs that are different from their regular wines. Could Colorado offer a similar enticement? On the same scale, of course not, but the success of Boulder Creek's Consensus show their is an interest in unique Colorado wines. Additionally, NVV hosted the educational Vintage Perspective Tasting. Tasting good wine a good draw, but adding value with educational tastings is even better. Last year, Colorado Mountain Winefest offered a "Life of Wine" seminar showing what aged Colorado wine tastes like for consumers. Offering a more detailed and academic tasting to trade and media would go a long way to help selling the Colorado wine industry. Not only was an invitation to the festivities in demand, the amount of cooperation involved was more than impressive. More than a dozen AVAs coordinated receptions the days leading up to the main event and they were timed to allow guests to attend many without much conflict. And at each of these receptions about a dozen different producers gathered at wineries and restaurants and worked together to put their best collective foot forward. Again, entertaining big-spending retailers and globe trotting writers is in a different world than most Colorado wineries are in, but that shouldn't matter. You never know who might walking into a tasting room. The devil is in the details and the details matter a lot more than many wineries realize. Proper stemware, valet parking and exquisite food made the events all the more enjoyable. Water crackers and white bread just don't impress people. Showing that you care about the food goes a long way to showing you care about your customers. The Pritchard Hill wineries brought up a food truck to Ovid that served delicious roasted goat. The Oakville Winegrowers brought in some of area's top chefs to the impressive caves at Far Niente Winery. Alpha Omega hosted a party after the auction (with no immediate need to keep wooing) and served some of the best pizza (from Pizzeria Tra Vigne) I've ever had. Oh, and the lunch at the Culinary Institute of America was an impressive sight to see and taste as well! But without question the most over the top reception was at Raymond Vineyards. 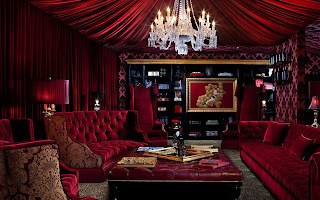 Jean-Charles Boisset purchased the estate in 2009 and has quickly turned it into a Las Vegas-worthy destination for wine lovers. The winery has been transformed in the ultimate tasting lounge in Napa. Lavishly decorated rooms are available for guests to belong to at different membership levels and with different perks. The party even had a theme: Napa Gras. Costumes were encouraged and Mardi Gras feather masks were handed out to all the guests. Go-Go dancers entertained on one of the (many) bars and to make sure the event was over the top, an aerial ribbon dancer pour sparkling wine from above the masked guests. I can't say that I've ever seen anything like this party at a winery before. However, perhaps the most important thing was the generosity of the individual wineries. They saw no direct financial benefit. They donated the auction lots to raise funds for the betterment of the entire Napa brand. They also donated wine for lunch between the barrel tasting and auction. I know wineries aren't exactly fond of giving away product, but realizing that giving a little now might (there are no guarantees) come back tenfold down the line. Wineries most likely aren't going to be successful in the industry by themselves and building relationships takes effort. It was abundantly clear the amount of effort that went in last week's events in the Napa Valley. The effort that goes into a series of events like this is something all other wine regions should strive to duplicate.